This friendly guide shows you how to select the right training method for your dog, based on his unique personality, to reach your desired goals. Whether you want to teach Buddy to sit or master retrieving, you'll get expert training tips and techniques for you and your dog — to ensure a mutually respectful relationship with your four-legged friend. Part I: Setting the Stage for Successful Training. 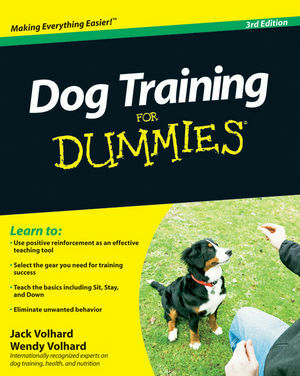 Chapter 1: Dog Training: The Key to Your Dog’s Safety and Your Sanity. Chapter 2: Canine Psychology 101: Getting to Know Your Dog. Chapter 3: Developing Training Savvy. Chapter 4: Understanding the Vital Role Nutrition and Health Play in Training. Chapter 5: Gearing Up for Training Success. Part II: Performing Puppy Preliminaries. Chapter 6: Surviving Your Puppy’s Growth Periods. Chapter 7: Starting Puppy on the Right Paw. Chapter 8: Honing In on Housetraining. Part III: Tackling Training Basics. Chapter 9: Mastering Some Fundamentals: Sit, Down, Stay, and Leave It. Chapter 10: Canine Cruise Control: Walking on Leash and Coming When Called. Chapter 11: Dealing with Common Doggie Don'ts. Part IV: Taking Training to the Next Level. Chapter 12: Participating in AKC S.T.A.R. Puppy and Canine Good Citizen Programs. Chapter 13: Training for Fun and Competition. Chapter 14: Completing the Companion Dog Title. Part V: Dealing with Special Situations. Chapter 17: Helping Your Hound Handle Special Situations. Chapter 18: Teaching an Old Dog New Tricks: Keeping Your Senior Young. Chapter 19: Supplementing Your Training Efforts with Expert Help. Chapter 20: Ten Training Traps and How to Avoid Them. Chapter 21: Ten Fun and Exciting Sporting Activities. Chapter 22: Ten Reasons Dogs Do What They Do. Chapter 23: Ten Tricks for Fun and Games.